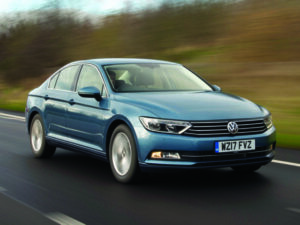 Petrol power returns to the Passat, but is it a step too far for fleets? Alex Grant finds out. Three years ago, Volkswagen was launching the latest Passat with an all-diesel line-up, reasoning that, with 80% going to fleets and less than 1% of UK cars taking petrol engines, there wasn’t a business case for anything else. As the tide turns, slowly, against diesel, it’s gone back on that decision. There are now four petrol turbocharged petrol engines to choose from: two 1.4-litre units at 123bhp and 148bhp, a 178bhp 1.8-litre and a 217bhp 2.0-litre shared with the Golf GTI. It’s not that Volkswagen expects an overnight migration to petrol, but it believes the Passat range should have the option for those who want it. These are genuinely efficient engines, so it’s not quite the giant leap it seems. Petrol comes in between £1,700 and £2,200 less than the equivalent diesel, without the burden of a 3% Benefit in Kind levy. As the 113bhp 1.6-litre and 148bhp 2.0-litre TDIs will soon be getting AdBlue injection, there’s a growing business case for the right end-user. But the smallest leap comes from the 148bhp 1.4 TSI, which is neither competing with the ultra-frugal 1.6 TDI, nor the relatively high bang-for-buck of a powerful diesel engines, as the other petrols are. Available on all trim levels, it’s the only petrol Passat capable of running on two cylinders to save fuel at low loads, and CO2 emissions are within a few grams of the 148bhp 2.0 TDI. Drivers will welcome its refinement and peppy performance, while operators should find 45-50mpg palatable, if a little short of the figures they’d get from a diesel. Not much has changed here; diesel engines still offer the economy most high-mileage fleets require, and independent tests have proved Volkswagen’s TDIs are among the cleanest in the industry. But this fleet staple shows the business case for petrol is, slowly, starting to stack up.